In 1852, just two years after California was admitted into the United States of America, Santa Barbara greeted her first resident physician, Dr Samuel Brinkerhoff. Samuel Brinkerhoff was born in New York in 1824, and lived in Santa Barbara, his beloved town, until his death in 1883. For several years, he remained the only physician for many, many miles in every direction. Dr. Brinkerhoff had the privilege of watching the fledgling community grow and prosper, and he asserted his encouragement and influence in its development. He was a respected civic leader and was known as "a man of great public spirit and character," one of "God's own men." He imagined the Santa Barbara of the future: "It was his ambition to see Santa Barbara linked by railways with the great overland roads of the continent." He dreamed of a college here, one day, as well. Dr. Brinkerhoff was gifted in the healing arts, caring for both body and spirit. He was known to be "more than a physician, he was a good Samaritan....He was found at the bedside of the poor at all hours and all seasons....and remuneration for services was never a feature." "His life has been a ministry of good," his widow wrote in 1885. And when the town turned out for his memorial, Santa Barbara had the "largest funeral procession ever seen....the line of carriages was fully half a mile long." His legacy remains, even now. 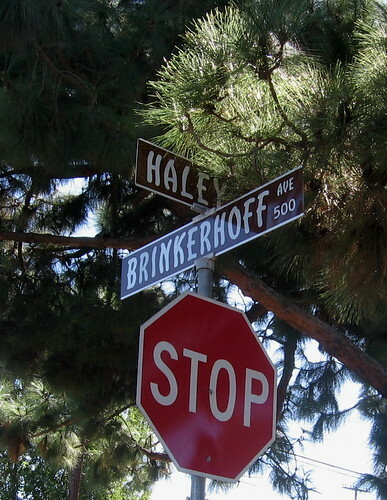 One of the most picturesque and historic streets in Santa Barbara is named for him: Brinkerhoff Avenue. 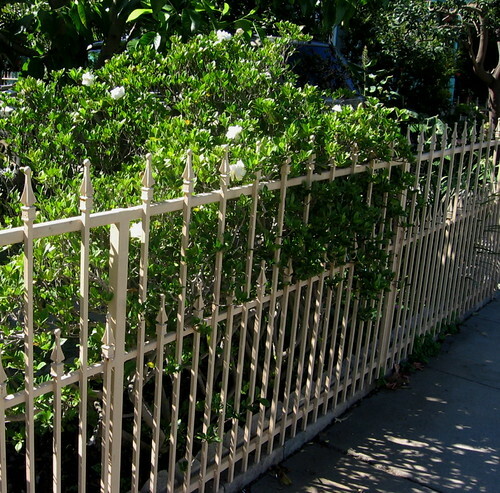 Situated two blocks west of State Street, between Haley and Cota Streets, you will find Brinkerhoff Avenue. Tall old pine, redwood, and liquid amber trees are interspersed with palms and eucalyptus. 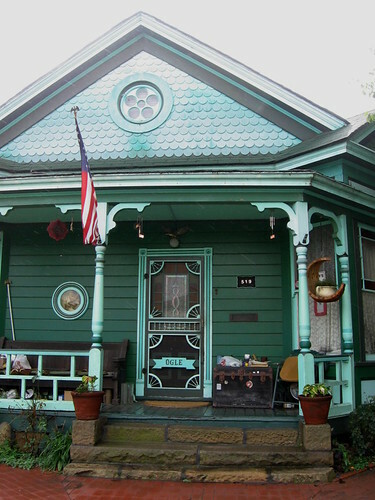 They cast a light shade over the sidewalks, and the sun filters on to the lawns and gardens of the Victorian homes that retain their original style, charm, and colorful mien. Dr. Brinkerhoff's home still stands today, in the middle of the block on Cota Street. From the upstairs porch, Dr. Brinkerhoff might still look south toward the old neighborhood he loved so much when he was alive - the street now known as Brinkerhoff Avenue. 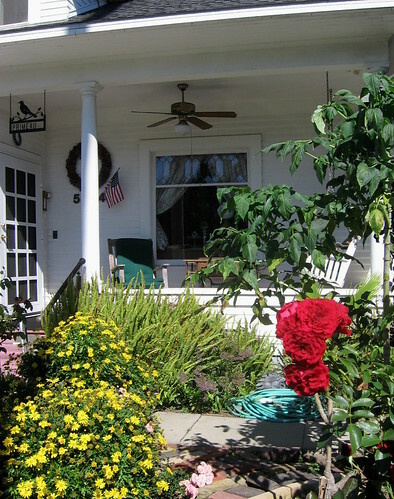 Many of the homes on this street are still single-family residences, with casual and loose flower gardens facing the street. or interesting little shops, like this one - Loop and Leaf - a knitting shop/tea parlor. 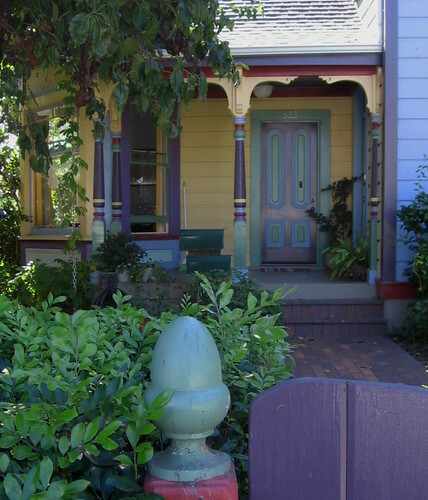 It's a wonderful street to visit for anyone who wants a glimpse of Santa Barbara during her Victorian phase - before the big earthquake of 1925 that inspired the metamorphosis of the town into a Mediterranean-style mecca. 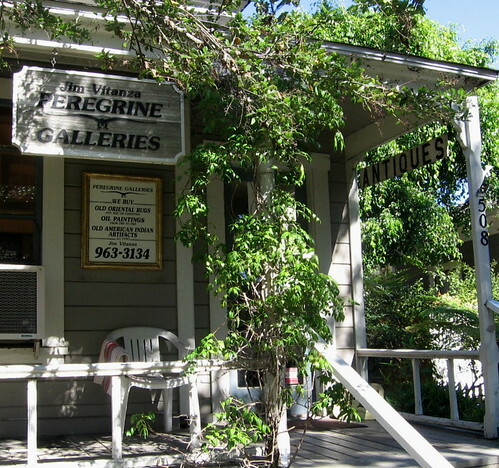 Also located on Brinkerhoff Avenue, is the Ogle House. Purchased by the Ogle family in 1973, the Ogle House is purportedly still the home of Harry Hawcroft, the man who built his abode in 1888. Harry Hawcroft was an impeccable gent, who was known throughout town for his immaculate and fashionable appearance. He immigrated to the United States from England, and made his living as a blacksmith. 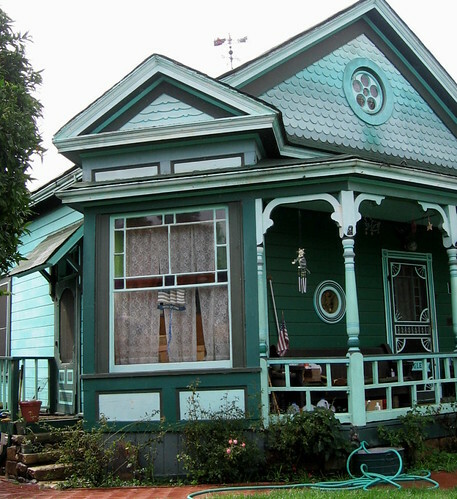 He owned his own blacksmith shop at what is now the corner of Brinkerhoff and Cota Streets. Blacksmiths were very important men in their communities as they made and repaired farm machinery, kept carriages and buggies on the road, and forged many of the tools used in daily life at that time. He married, built a home, and started a family. 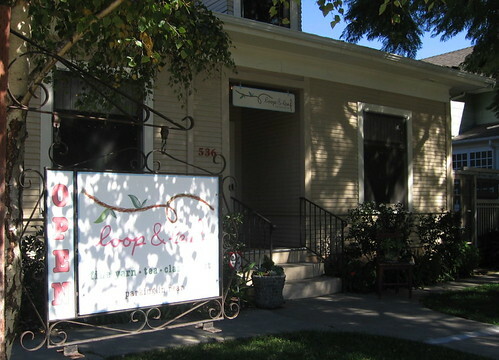 Later, his blacksmith shop was moved to 512 State Street, which later became the original address of Joe's Cafe, one of Santa Barbara's most beloved restaurants. And Mr. Hawcroft became known around town as "Lord Harry", for his stylish appearance, his English accent, and the fact that he wore white shirts while working at the forge - and kept them clean and pristine, despite the hot and dirty work. He loved bow ties, bowler hats, and fancy threads. Lord Harry was a family man, fully rooted in his community. In 1889, he entered the California State Agricultural Show, 18th District. People from all over the Santa Barbara County area gathered to share and show their best produce, home crafts, livestock, and their finest skills, in a variety of categories. The roster of categories and winners tells us much about the Victorian Santa Barbara. The honor of "Prettiest Baby Over Six Months" went to Mary Barnett; the "Next Prettiest Baby Over Six Months" was awarded to Eunice Hiller. There were floral exhibits and arrangements. The famous plantsman, Joseph Sexton, won the prize for his "Parlor Bouquet". N. Lambert took the prize for his "Taxidermy Display". There were other winners, too, for "Pampas Plumes - FH Kingman"; and horses: "Best Family - Don Patricio and four colts", owned by IK Fisher; the " Draft Team - Mike and Lewis", that was owned by JR Thurmond; and under the category, "Buggy Animals", the winners were "Aurelia and Kellick" a fine pair of horses. Another winner that year was Harry Hawcroft, who took home the silver medal for his work in "Blacksmithing". State Agricultural Report for the Year 1889, page 985. By all accounts, Lord Harry had a perfectly contented and wonderful life in his city, Santa Barbara. He was a business owner, a family man, a man who loved to build, garden, and create beautiful things that would last long after his time on earth. 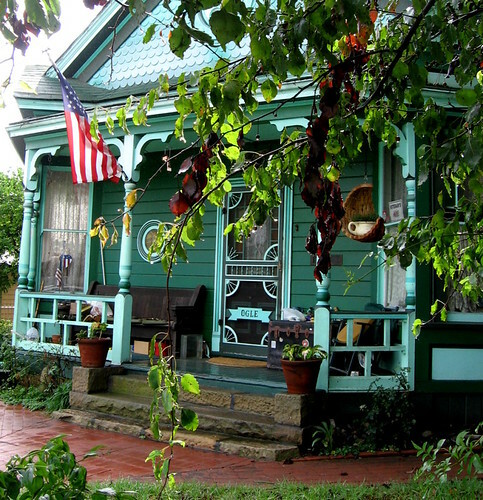 He lived in this picturesque little home until his death in 1932. The home that Harry Hawcroft built is still strong and beautiful, located at 519 Brinkerhoff Avenue. 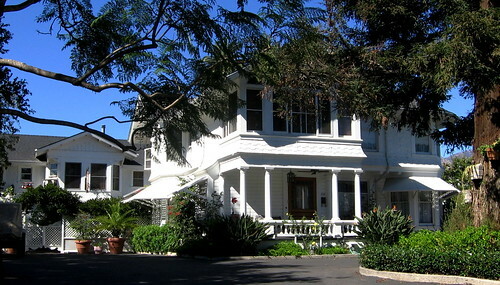 George and Mary Anne Ogle purchased Harry's home in 1973. They were delighted with the historic ambiance and quaint little street. However, they got a bit more than they had originally bargained for. According to a Santa Barbara News Press article written by Maria Zate, published on October 31, 2004, Mr. Ogle claimed that Lord Harry was still known to put in a day's work - at night. Mr. Ogle reported that he, "was adding a third-story bedroom to the attic space a year or so after moving in. Several wood panels were nailed into place after Mr. Ogle...went to bed. 'I didn't believe in ghosts...but when this happened three times, it made me reconsider.'" In addition to his fondness for late-night carpentry, he has been known to wander about after dark. A friend who was staying with the Ogles went into the kitchen late one night and saw Harry's ghost - "a man dressed in a tuxedo standing in the kitchen...he turned and vanished....I was not dreaming." Through the years, there have been other reports of a shadowy, dapper ghost who appears on Brinkerhoff Avenue - the description matches that of our friend Lord Harry. 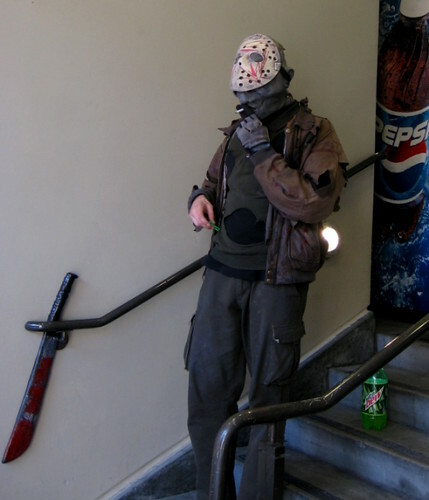 He has been seen walking along the sidewalks in the moonlight, dressed in his finest attire. So if you find yourself face to face with Lord Harry, or the good doctor late one night, don't be afraid. Some ghosts linger among us not because they are angry or frightening....but like Lord Harry, they still enjoy a stroll through old neighborhoods, maybe a friendly conversation, and the opportunity to stop and smell the flowers. I can't talk about Hollywood. It was a Horror to me when I was there and it's a Horror to look back on. I can't imagine how I did it. When I got away from it I couldn't even refer to the place by name. ''Out there,'' I called it. 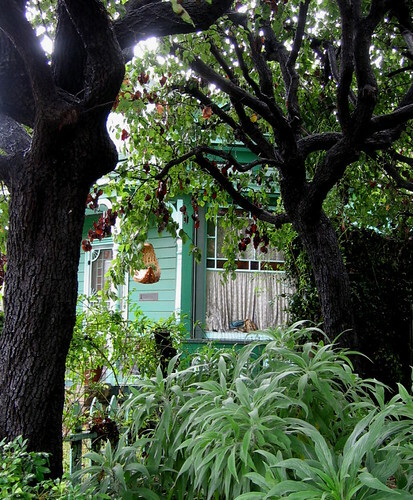 Persimmon trees are garden sculpture. No matter the season, they are dazzling. In the winter, their languid branches shimmer with taupe bark - silvery and bare. The springtime brings bright eager leaves of chartreuse. Their attitude is dramatic and tropical. The fruit forms during the summer months, tight and bright green. It grows, hidden by the wide, leathery leaves - now aged to a deep green - that offer a dense shade. Then in autumn, the leaves turn to yellow, red, and orange - bright primary colors. 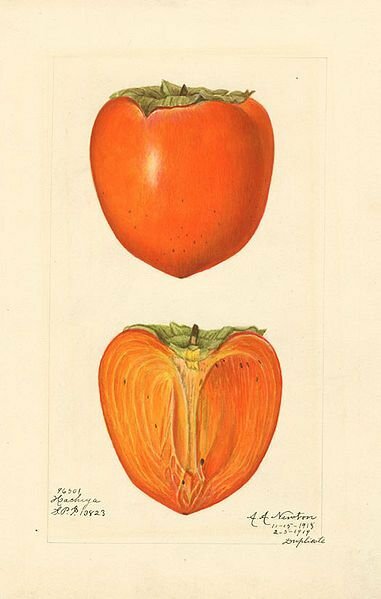 The fruit starts to ripen to a carnelian orange-red, and appears firm and waxy. In late fall, the leaves drift down to form a painterly carpet on the ground. Only the fruit remains - now a rich, jewel-like, Japanese-sunset orange - scattered along the bare branches. I take them from the tree when they are still firm, and deeply colored. I line them up on the yellow kitchen counter, near the window. 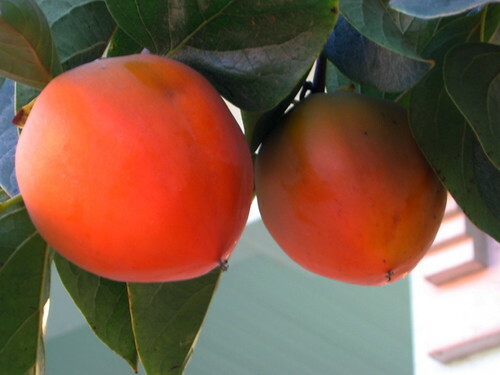 In only a few days, they are fully ripe and ready to eat. Then, they are sweetly, syrupy, stickily sublime. They can be eaten, simply, with a spoon. But I also like to cook with them. I collect cookbooks, and one of my perennial favorites is entitled, Generation to Generation, A Family Cookbook. It was written in 1984 by members of the Orange County Buddhist Church in Anaheim, California. It has a wonderful recipe for persimmon bread that I make every year. The Generation to Generation cookbook contains lots of recipes - for appetizers, breads, main dishes and salads, as well as desserts. There is a special section of Asian recipes, as well some Polynesian foods, too. I even found Lithuanian, Jewish, Swedish, Italian, Chinese and Mexican recipes. One entire chapter is devoted to strawberries. Before the California's Japanese-Americans were placed in internment camps during World War II, they were virtually the exclusive owners and growers of strawberry farms in California. 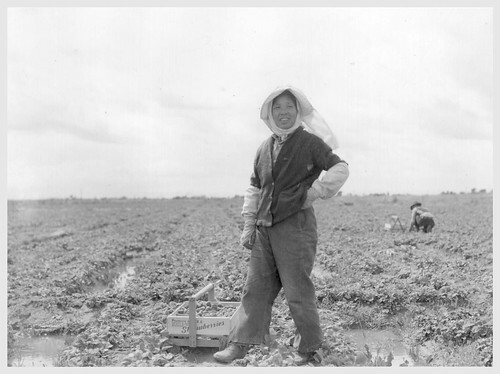 Japanese-Americans have always been leaders in California's agricultural industries. The National Park Service website has a section entitled History of Japanese Americans in California, which tells the story of the arrival of the Japanese in California, their contributions, adversities, and triumphs as California citizens. The cookbook, Generation to Generation, features not only recipes, but vintage photographs of California's early Japanese-Americans, the Issei, Nisei, Sansei, and Yonsei, (first, second, third, and fourth generations) - family members of the congregants of the Orange County Buddhist Church. From this very special book, I have selected one of the best recipes I have ever found for persimmon bread. 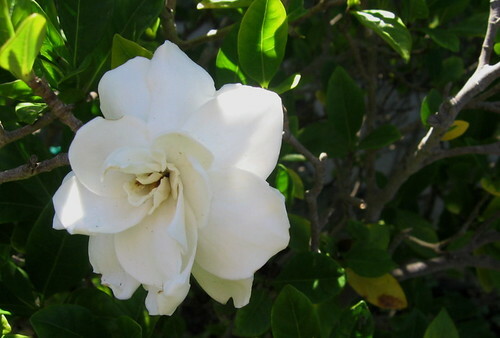 It is dark, rich, and fragrant. It is the perfect autumn treat. ~Bake at 360 for one hour. ~Will make two 9" x 5" loaf pans, or five 6" x 3.5" pans. Wrap in foil after cooled. Best 2-3 days after baking. "establish a temple where they would be able to practice the basic teachings of the Buddha and to create a gathering place for community and cultural activities....Since then, the Orange County Buddhist Church has become one of the largest Buddhist churches in the United States." UPDATE! The newest version of the Generation to Generation Family Cookbook is available! Click here to access the order form. It will become one of your favorite cookbooks - I promise!